Andrew Luck will make his NFL return on September 9 against the Cincinnati Bengals. INDIANAPOLIS – Andrew Luck traipses across the locker room with a little extra pep in his step these days. It’s obvious from the smile that the Indianapolis Colts‘ starting quarterback is content to put on his shoulder pads, prepare for practice and get ready to make his first regular-season start in more than 20 months. Sure, there were times Luck questioned when or even if this day would come, whether he could regain the Pro Bowl form from his first three pro seasons after shoulder surgery and whether those regular pregame jitters he craves would again be part of his game-day routine. Now, just a few days away from facing Cincinnati’s defense, Luck looks and sounds like the confident leader everyone expects him to be this season. Luck understands just how heavily scrutinized these first few games will be. He anticipates a litany of questions about his health, the subtle changes he’s made to his throwing motion after working out with former major league pitcher Tom House, his ability to bounce up after big hits and whether using the sidelines and baseball slides will change his approach to the game. After all, it was the hit he took from behind in the third preseason game that caused a minor foot injury that forced him out of two practices last week. But the fact he is talking about his foot rather than lingering pain in his right shoulder certainly is a sign of progress. The darkest moments appeared to come after Luck shut down his throwing regimen and went on injured reserve last fall. He spent several weeks seeking additional opinions to determine whether a second procedure was necessary. Once assured nothing was structurally wrong, Luck headed to the Netherlands in November where he worked for more than a month working with a trusted trainer in relative anonymity. When he returned to the team complex in late December, Luck was clearly a frustrated man. It took more than five months to see actual results. Luck resumed throwing footballs in May, a secret he kept by swearing first-year coach Frank Reich to silence. Then, on the second day of Indy’s three-day minicamp Luck made a surprise return and began flinging footballs around the practice field for the first time since October. Suddenly, the conversations changed throughout the city. 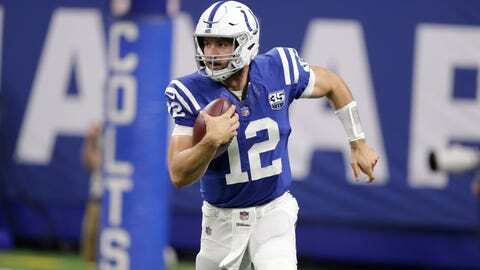 Reich and general manager Chris Ballard outlined a training camp plan that called for Luck to mimic his regular-season routine by throwing three times per week in non-game settings. Luck’s brief appearance in the preseason opener at Seattle eased most doubts about whether he’d start the season opener. His ability to survive big hits in each of the first three preseason games proved to fans, coaches and critics he was healthy. And if any additional assurances were needed, teammates found them in Luck’s demeanor on and off the field. Now Luck must deal with yet another test. He faces a Bengals defense that includes sacks artists such as Geno Atkins, Michael Johnson, Carlos Dunlap and Carl Lawson with the possibility of playing behind two new tackles. Longtime left tackle Anthony Castonzo did limited work in practice Wednesday and his status for Sunday’s game remains unclear. Reich said he’s decided on a starter at right tackle, but won’t make an announcement till Sunday. He knows he’s endured tougher predicaments and experienced more mentally challenging moments over the past 20 months while rediscovering his passion for the game. And he can’t wait for the moment, Saturday night or Sunday morning, when his stomach tightens and those nerves start firing.